This is Part Two of our exploration of Sidewalk Toronto: Read Part One here. Sidewalk Toronto, however, is anything but typical. And while the sheer size and control of the project raises some legitimate concerns ranging from privacy to affordability, we were excited to see that they have dedicated a staggering $50 million to the engagement and testing phase of their new Quayside development. Few details have been released about what this will involve, other than some proposed experiments in transportation and sustainability technology, and a community process resulting in the creation of a final “Master Innovation and Development Plan” (MIDP) for review by their local partner, Waterfront Toronto. But by all accounts, this is a nearly unprecedented amount of money to dedicate to community process. 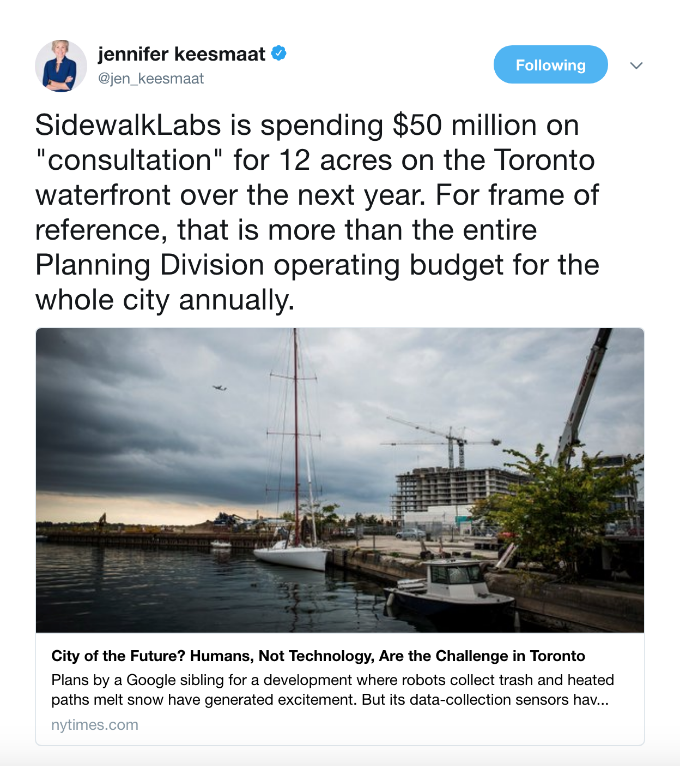 As a point of comparison, former Toronto Planner Jennifer Keesmaat pointed out that Sidewalk Toronto’s $50 million is larger than the annual operating budget of Toronto’s entire Planning Department. The MacArthur Foundation, meanwhile, considers $100 million enough to address a challenge on a global scale. 1. Start early, never stop. Sidewalk Toronto has already kicked off the project with this step in mind, engaging with Torontonians (and Tweeters) at a sold-out “town hall” meeting in November. By doing so even before all the details of the project have become clear, they avoided a common misstep among developers. This early contact gives people the opportunity to weigh in on the overall vision for the project in the first place, defining the problems that must be solved, rather than simply fiddling with the details of solutions already decided for them. But it is crucial for Sidewalk Toronto to remember that community engagement isn’t just a phase; it is an ongoing commitment and process to which they must return again and again. While the Master Plan created at the end of that $50M will be important to keeping them accountable to the public interest, there’s always the danger that too strict a plan will lock the planners inside a runaway train, watching helplessly as changing circumstances pass them by. What if they bet on the proverbial Betamax instead of VHS? What if Quayside’s public realm is mysteriously empty and lifeless? As Holly Whyte once said, many planners would rather go to hell with a comprehensive plan than to heaven without one. This is especially important because Sidewalk Toronto’s ambitions don’t stop at Quayside. Plans to expand into the nearby Port Lands are already out in the open. 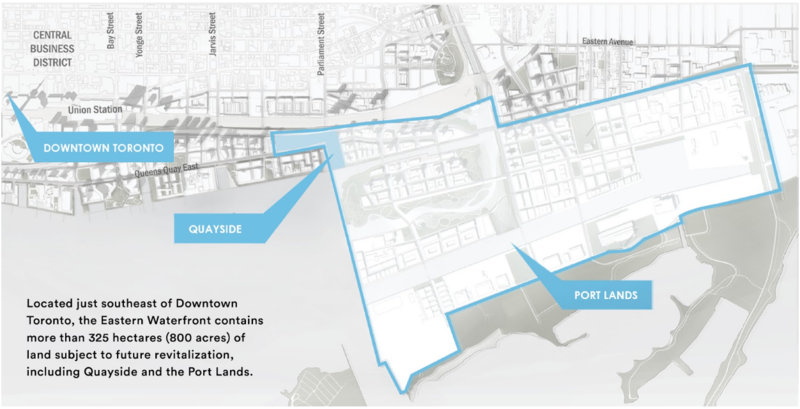 The path to the waterfront hasn’t always been smooth for Sidewalk Toronto, with some back-and-forth between Sidewalk Labs, Waterfront Toronto, and the City of Toronto over the expansion plans, including rumors that the City was planning to sell much of the Port Lands to the film industry. As they move forward in this context, an ongoing, constructive relationship with the public will yield political, as well as technical, benefits. 2. Go where (and when) the people are. 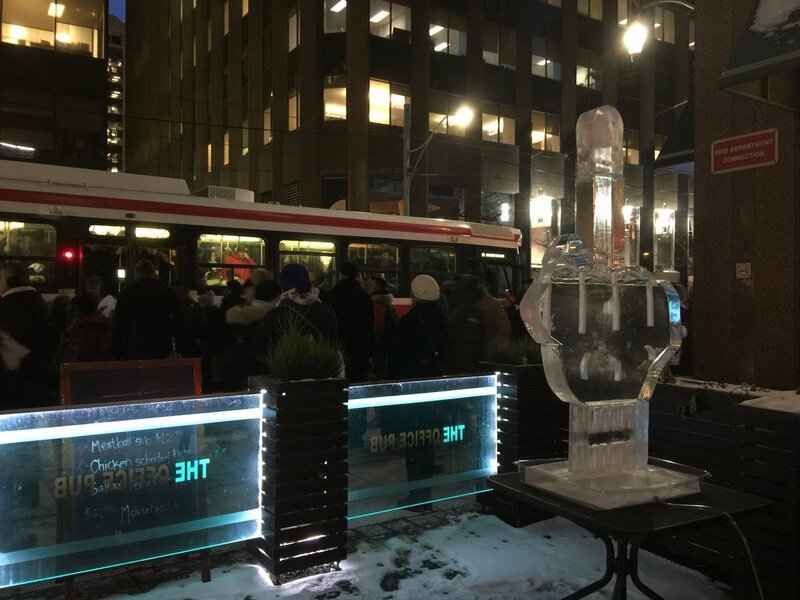 As Sidewalk Labs CEO Dan Doctoroff has insisted, Sidewalk Toronto is committed to “reflecting the diversity of the broader metro area.” But engagement processes frequently fail to represent the entire community, and it’s a safe assumption that the people with the most to lose are also the hardest to reach. Traditional community meetings are technically “open to the public,” but there are many barriers that narrow participation to people with more time, more money, and more civic literacy. How will Sidewalk Toronto do things differently? One simple but labor-intensive solution is offering more ways, places, and times to engage. Sidewalk Toronto has already been using Twitter and an “Ask Me Anything” (AMA) thread on Reddit to reach a different audience, but these strategies come with their own set of exclusions, and they are no replacement for accessible, approachable, in-person opportunities. For example, pop-up stations can help reach broad swaths of the general public at popular events, or particularly tricky-to-reach demographics at smaller community events and everyday places like grocery stores, schools and churches. For many people, answering a few questions, writing down a few ideas, or voting on the ideas of others at these stations can also be less intimidating than attending public meetings that often have an “insider” language of their own. Toronto’s former chief planner Jennifer Keesmaat has set a great precedent for this kind of engagement with the innovative Planners in Public Spaces (PiPS) program. Lastly, if Sidewalk Toronto wanted to take things to the next level, they might consider reopening a version of Toronto’s well-loved Neighborhood Planning Offices, storefront offices and engagement locations that offered an unprecedented depth of interaction between planners and the community from the 1970s to the 1990s. 3. Remember, there’s no such thing as a free lunch. Sidewalk Toronto recently hired a local privacy expert to help address concerns about the use of data collected at Quayside. But if Sidewalk Toronto really believes the community is the expert on place, like we do, why not use some of their extraordinary budget to pay ordinary people for their expertise, too? Sidewalk Toronto could ease the burden of participation by offering free childcare and food and beverages on site, and reimbursing travel costs. They should also consider the opportunities for work or other activities that participants give up in order to provide their indispensible insights. University studies and corporate focus groups often pay participants for their time and expenses to ensure they have a representative group, so why shouldn’t city-builders with a budget do the same? 4. Collect data through citizen science. Why collect data by hand, when sensors can do it? As Ray and Charles Eames put it; "Never delegate understanding." As PPS has learned through more than four decades of experience, observing and recording public spaces firsthand can enrich community engagement in crucial ways. At Quayside, Sidewalk Toronto should look beyond sensor-driven data, and observe the city at eye level alongside residents. In his Reddit AMA, Sidewalk Labs’s CEO Dan Doctoroff mentioned “adaptive traffic signals that can recognize pedestrians, cyclists, and transit vehicles (in addition to cars) at intersections, helping to improve intersection safety for all users.” These innovations sound promising, but particularly at first, they should measure more than just traffic and include observations of the intersection by real people. Innovations are especially susceptible to the law of unintended consequences, and until machine learning obsolesces us all, a sensor will only record the kind of data it is engineered to capture. Well-trained citizen data-collectors, especially ones who know a place well, are far more aware of qualitative data like behavior, perceptions, and emotions, and also more likely to get productively distracted by data beyond their scope. Those human hunches can be vital to figuring out what future standardized sensors should be measuring in the first place. Even if machine learning eventually yields a better result—although we remain skeptical—citizen science still gives people the indispensible knowledge, confidence, and enthusiasm they need to participate in public processes. We applaud Sidewalk Toronto (and Waterfront Toronto’s RFP) for their intention to implement a few Lighter, Quicker, Cheaper pilot projects alongside their engagement and planning process. But for maximum effect, these two processes should be intentionally intertwined. Pilot projects are not just practical—they’re fun! They can be a way to show the community that their feedback is being put into action, and build up the trust necessary to achieve even bigger goals together. That’s why Sidewalk Toronto should invite the community to participate in their pilots as inventors, implementers, and evaluators, and give regular progress reports to the general public. They should even hold community meetings out in the world sometimes! 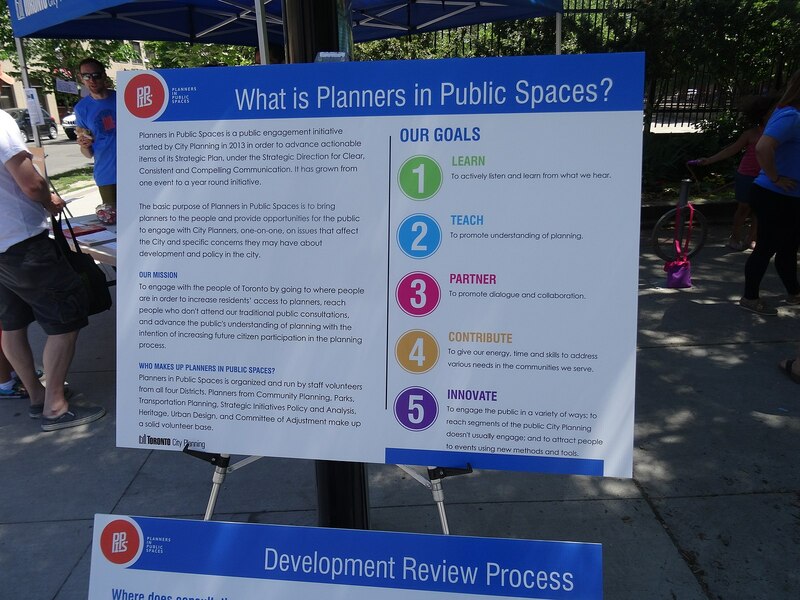 Public space pilots that attract lots of people offer particularly ripe opportunities to gather additional community input through a placemaking workshop, pop-up stations, or intercept surveys. In short, when people think of community engagement, they should not think of arcane meeting procedure, uninvited monologues, stale coffee, and dim-lit rooms. Community engagement should be an energizing campaign—a virtuous cycle of vision, action, and observation that builds a community’s capacity and desire for change. Much has been said about how the urban innovations developed at Quayside will not only benefit the people who live there, but also the rest of the city and perhaps the rest of the world. However, Sidewalk Toronto should not squander this opportunity to also reinvent the often exclusive, rigid, and dysfunctional community processes that have prevented our cities from living up to their full potential. The Quayside project must build on the good work already started in Toronto’s planning department to help Torontonians explore what kind of city they want to live in, and to broaden who gets a say in that vision. Watching how Sidewalk Toronto spends their first $50 million this year will reveal how serious they are about deeply engaging citizens in co-creating a waterfront that is not only a beacon of affordability, sustainability, and accessibility—but also a game-changing model of community-driven planning, governance, and placemaking. Stay tuned for more coverage of Sidewalk Toronto!